The Ampex MM-1200 Multichannel Recorder/Reproducer provides up to 24 channels of audio recording/reproducing capability using one-inch or two-inch audio recording tape. The 8-channel version uses one-inch tape and the 16- and 24-channel versions use two-inch tape. The Ampex MM-1200 is capable of operating in any of three speeds; i.e., 7-1/2 in/s, 15 in/s and 30 in/s. When the associated PWA is properly strapped, any two adjacent speeds are front-panel selectable by means of a high/low speed switch. NAB and IEC (CCIR) equalization capabilities are also provided. The Ampex MM-1200 provides the capability of recording on one or more channels simultaneously while monitoring one or more previously recorded channels. A Sel Sync* (Selective Synchronization) feature permits monitoring a previously recorded channel while recording in synchronization on one or more channels. This feature is enabled by using the record head of that previously recorded channel in a playback mode while one or more record heads are in the record mode. The Ampex MM-1200 Recorder/Reproducer consists of a tape transport assembly, a transport control assembly, a frame assembly, a motor-drive amplifier assembly, a head assembly, audio electronics assemblies, a control box assembly, a power supply assembly, a meter panel assembly, an accessory panel, and an input/output panel assembly. Multi-pin connectors are used extensively between units to facilitate removal and replacement of various components and assemblies. Foundational text courtesy of AMPEX Corporation MM-1200 Operations Manual. 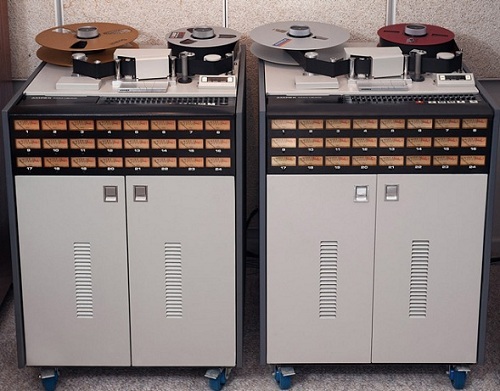 Do you have content, to add, about the Ampex MM-1200 Tape Machine or associated topics? Please feel free to Share it, here!